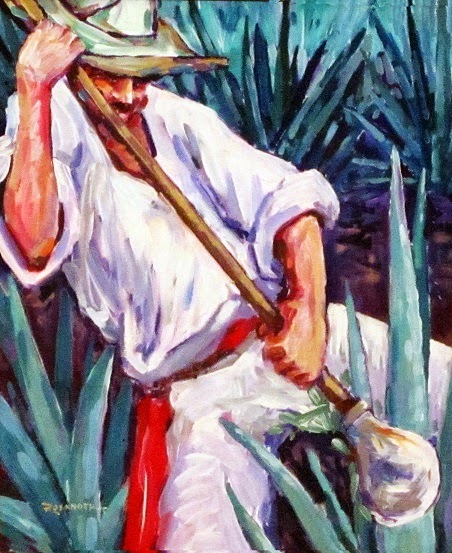 Tools of the Tequila trade: El jimador and his coa de jima. when did we get so old ? that looked up to you. but a life well lived. The Bar None Group has been a fan of Ayala Zarfjian and her poetry for a few years. We are honored to have her share one of her poems with our readers. This engaging poet from Florida believes in living each day the best way possible — to Ayala, the glass is always half full. As well as being a favored poet she is also a mother, wife, entrepreneur, blogger and, dreamer. Patron Shots With My Brother first appeared on her poetic website, a sun kissed life. The artwork accompanying Ayala's Patron Shots With My Brother is El Jimador by Russell Rosander, artist and co-founder of the Bar None Group. Thank you, Mark. I am honored to be here! I love your work ! You are the star here today, Ayala...shine on! Just kidding. Happy birthday to your bro, little sister! Isn't it FUN to "remember"? And then, let it go, agreeing it was--all-in-all...GOOD! Ayala. I recall using one painting by Russell Rosander in my blog about year ago...(at least I see the same paint markings, which I really like(d). I copied it from your blog--and did not remember--do you recall? Thanks, whether that is correct or not! Steve, I have sent you an email with a request.